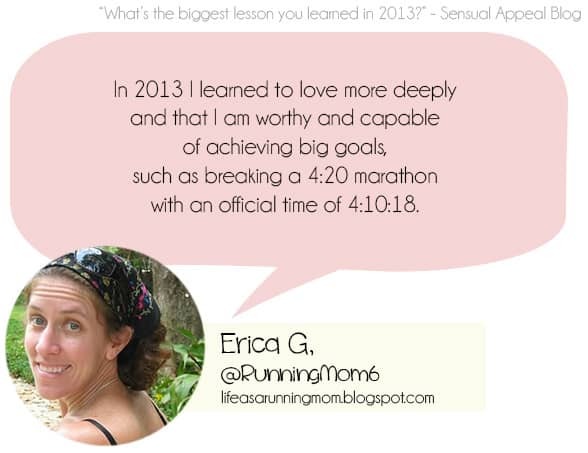 What is the biggest lesson you learned in 2013? While I am not one to dwell on the past, I think it can beneficial to look back at the past year through a lens of positivity and reflect – What are some of the things that happened that helped shape you who you are today? What events made you reflect on who you are want makes you happy? Did you make any mistakes that you learned from? What accomplishments have you made? What are some of the biggest things you learned that you can take with you to the new year that will help you grow in the new year? 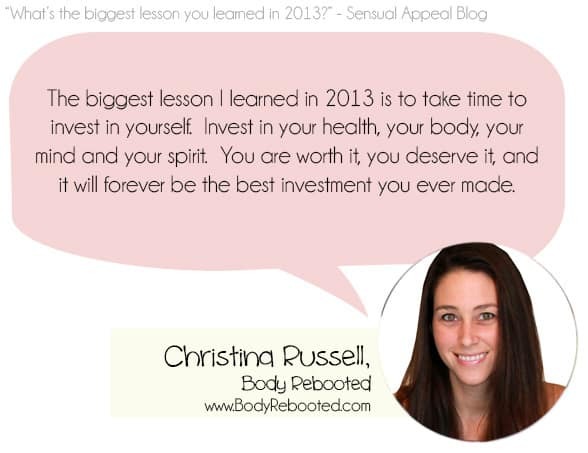 I asked some of my favorite blog friends the following question “What is the biggest lesson you learned in 2013?” and I collected their responses to share with you – in an effort to inspire and motivate you to look within yourself and reflect on the past year through the lens of positivity and opportunity. Read through the responses and make sure to reply to the question in the comment section and share with us your own biggest lesson learned. I created a video where I tell you what is the biggest lesson I learned from 2013 and compiled the responses you see below. Watch it and please share it with your friends so everyone can get inspired to reflect and grow. 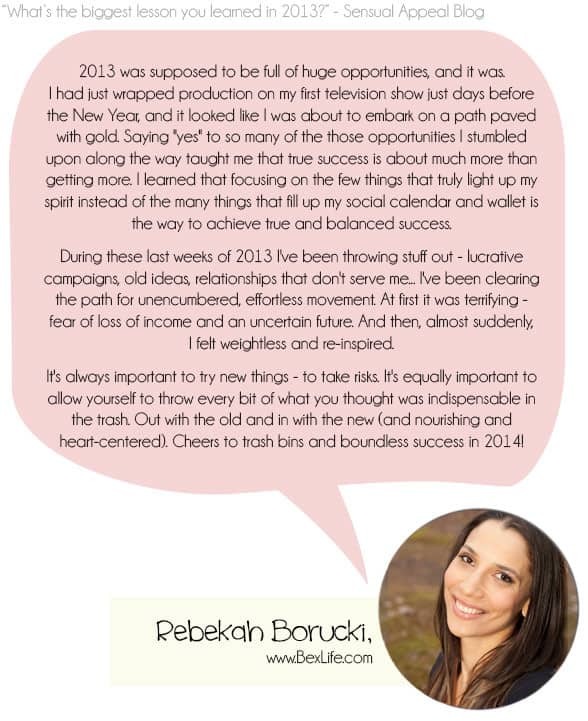 Thank you to all my dear blog friends for sharing with me and you their insights on 2013. I am full of gratitude and appreciation for having all of them continue to inspire me and motivate me. I am also extremely grateful and happy for having YOU here, reading this, and continuing to support me on my own journey through Sensual Appeal. Let us know in the comments! Let’s end the year 2013 on a high note, reflect back and gather the positive insights and begin the new year with a new understanding, satisfaction, and positivity. From the bottom of my heart, I wish you that 2014 will be the most amazing and beautiful year YET! Cheers! Thank you so much for asking me to be a part of this! What a great and inspirational post. Here’s to a wonderful 2014! Wow so many wonderful tips from inspirational women, thanks for sharing! This is a great post 🙂 In 2013 I learned to live with a positive mindset and it has made a huge different to the way I view things and I am so much happier too! Great lessons! I love how you put them all together. Happy New Year! Love this post! You included some of my favorite runners/bloggers! My 2013 review is about what turned out to be my year of learning! This is so inspiring!! Thank you for putting it together. Plus it’s some of my all-time favorite bloggers. I learned that some things I just can’t control and how to let go. Happy New Year! I was reading down though all the posts on the “what I learned” I think it’s a great idea to look at other people’s lessons so that we can learn from them. My biggest lesson learned in 2013 is to BE PATIENT!!! Oh yes, patience surely is a great virtue. It’s an important lesson to have learned. Thank you for sharing, Layla! What a great post for the new year! I avoid resolutions — I think reflecting on lessons learned will help going forward into the new year. Hope you have a happy new year, Kammie! I adore this post!!! I’ve pinned it to look back on. Thank you so much for including me. Cheers to a great 2014! Thank you so much Laura! xoxo Happy new year! Thanks for the great and healthy recipes! The biggest lesson that I learned and for everyone to know is ‘self-love.’ Not selfish – but self love in meaning to take care of your self to enable yourself to care for others! Absolutely Kira! that is such an important lesson and I really hope that everyone realizes it and puts self-love at a higher priority. Happy new year! What a great post – love all of these lessons!!! This is a great list of lessons learned. This is advise we can all use in our lives in some form or another. I am impressed by how many bloggers you rounded up. I loved the layout of this blog post. It is definitely inspirational too for a new year full of goals. Thank you for taking the time to share this. I’m glad we were a part of the #SITSsharefest together today. Thank you so much for reading and the wonderful feedback, Crystal!